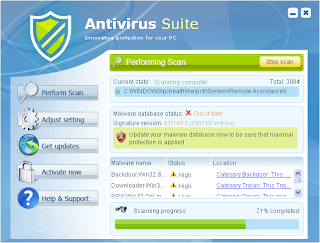 Antivirus Suite is a fresh rogue antispyware program from the same family as Antivirus Soft and Antivirus Live. Like other rogue antispyware programs, Antivirus Suite spreads through the use of trojans and imitates a system scan that reports false infections as method to trick user into purchasing a full version of the program. If your computer is infected with the rogue, then follow the Antivirus Suite removal instructions. This wretched trojan infected my PC and disabled all files that could help my system remove it. However, I performed a System Restore and everything appeared to be back to normal!